The Willow is a perfect option for people who are keen on setting up their home office, as well as families who want to enjoy plenty of space at home. This house plan has a total of 4,904 square feet and a finished area of 3,350 square feet. It features a three-car garage and a porch. It also has 2.5 baths and 4 bedrooms: a master suite with 2 walk-in closets and a spacious bath, and 3 other bedrooms. The first floor of the home has a study, a living and dining area, and a great room with a nook, kitchen, and family room with a fireplace. All bedrooms are found on the second floor of the home. Trust Perry Homes Utah to provide you with a wide range of options when it comes to affordable homes with premium construction. Our company has over 40 years of experience in the home-building business, and we use a process that will take the hassle out of buying a home. To ensure that each house will suit the needs and preferences of its owners, we have design specialists who will work directly with each client. We also provide financing options that will help make this big decision more manageable for homeowners. Take the first step in building your dream home today. 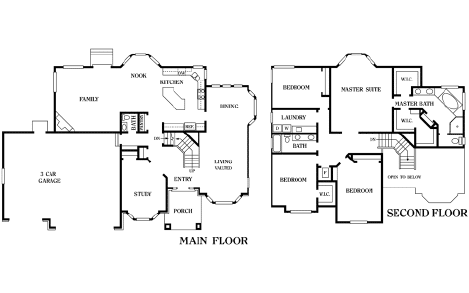 To get more information about the Willow or any other rambler or two-story house plans from Perry Homes, call 801-264-8800 or use our Contact Us page.